The Southeastern Raptor Center has been busy rehabilitating bald eagles this summer. The heart-lifting results include the recent release of two fledgling eagles. One was returned to the wild at the Girl Scouts’ Camp Pine Acres on Lake Allatoona, where anglers found the eagle injured in June. The other bird, discovered malnourished and near death in Irwin County, was released at nearby Paradise Public Fishing Area. Both young eagles are in debt to the Auburn University center, the Georgia Wildlife Rescue Association and a caring public, including Dr. Larry Branch at Quailwood Animal Hospital in Tifton. 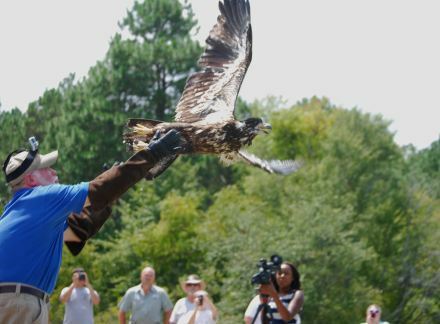 Watch the eagle release at Paradise. 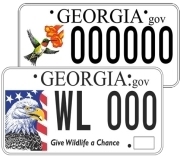 Buying and renewing a DNR eagle or hummingbird license plate provides critical funds to conserve Georgia's bald eagles and other nongame wildlife. Upgrade to a wild tag for only $25 and show your support! It's August 1998. Georgia’s sea turtle nest monitoring program is growing. Georgia’s primary nesting sea turtle, the loggerhead, is only holding on. New program coordinator Mark Dodd tallies loggerhead nests for the season. 1,068. Not bad considering there were 816 the summer before. But still shaky for a species on the brink. Flash forward to August 2015. In 17 years, the story has changed. Big-time. This season there have been at least 2,290 loggerhead nests. 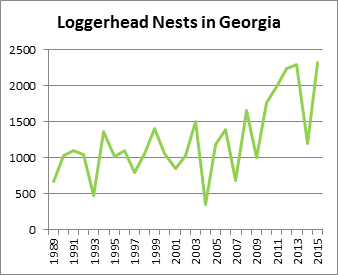 That's a record high since comprehensive surveys began in 1989 and more than double when Dodd started work with Georgia DNR. Even better, he expects genetic analysis that will likely confirm loggerheads made most of the 30 nests marked as "unknown species,” plus the discovery during hatching of nests not detected when they were laid, will push the Georgia Sea Turtle Cooperative’s count to about 2,330-2,350. Whatever the final number, it will continue a multi-year surge that indicates the beach-nesting species federally listed as threatened is recovering. Dodd’s perspective has undergone a similar sea-change over his DNR career, which included a low of 358 nests in 2004. “If you had asked me less than 10 years ago, I would’ve said there’s a possibility we’ll lose loggerhead nesting in Georgia,” he said. 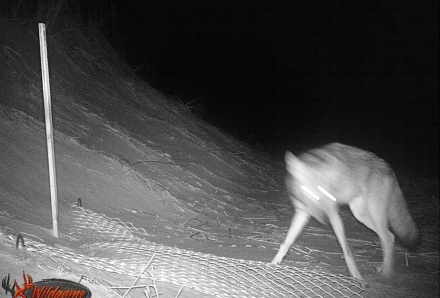 By comparison, trending concerns this year have been the increasing problem of coyotes raiding nests and human impacts on nesting habitat, such as too much hotel lighting and improper storage of beach equipment. Yet Dodd also worries that progress toward federal benchmarks for delisting loggerheads could result in efforts to loosen fishery restrictions and other measures that have helped conserve the species. Teasing out how effective each has been in turning around loggerhead nesting is difficult. 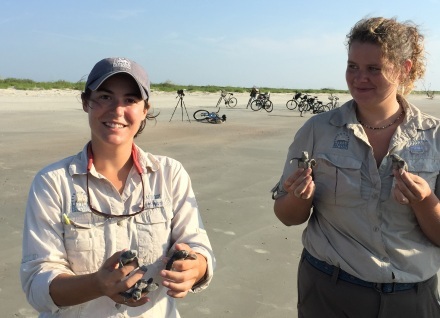 See loggerhead hatchlings scramble for the surf on Cumberland Island. As the season wanes, the latest new nest was made by a loggerhead on Little Cumberland Island Thursday. But as eggs hatch, Sea Turtle Cooperative members sometimes find nests they didn’t detect when they were made. The mean hatch success is at 70 percent, which is great, DNR's Mark Dodd said. Without the Sea Turtle Cooperative’s nest management, he estimates the success rate would be 45-50 percent. With more than 65 percent of nests emerged, even if tropical storm Erika, expected to reach Florida next week, brings a storm surge to Georgia, the impact on nesting will be diminished. Although this year's total will be a small increase over the previous record -- 2,289 nests in 2013 -- the longer-term trend of nesting increasing about 3 percent a year (see chart) is "an exceptionally good rate ... for a long-lived species with a low maximum-population growth rate," Dodd writes. Sea turtle strandings in Georgia are at 121 this year, slightly below average. Fishing-related mortalities have accounted for about 26 percent of deaths, and boat collisions for 19 percent. Loggerhead profile. Nesting season updates. Summer is fading. Fall bird migration is starting. Sea turtle nesting is ending. Yep, it’s time again for the annual Georgia Wild survey. This is where we ask you to tell us what you like or don’t about the newsletter. Complete the survey, include your email – it’s one of the questions – and you’ll be in the running for one of five wildlife tag T-shirts. The survey helps us improve Georgia Wild and gives you chance to improve your wardrobe. This where that win-win cliché truly fits. Sept. 16 is the deadline for entries. DNR employees are not eligible for the T-shirt giveaway. The Defense Department awarded $2 million from its Readiness and Environmental Protection Integration Program Challenge to benefit gopher tortoises on 7,016 acres at forts Benning and Stewart. The bases have joined with the DNR, Knobloch Family Foundation, U.S. Fish and Wildlife Service and Forest Service in a $16 million effort to help keep tortoises off the Endangered Species list, a change that could affect training on bases. Gopher tortoise eggs collected this summer for a head-start program are hatching, reports Dan Quinn of the Savannah River Ecology Laboratory. 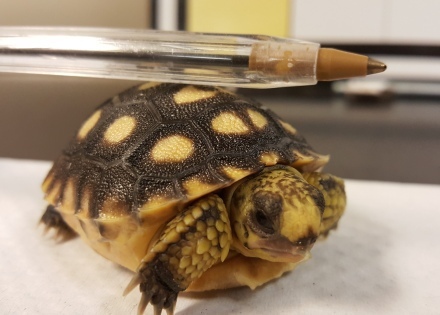 Using eggs from 2014, the collaboration between the UGA lab, DNR and St. Catherines Island led in June to the state’s largest tortoise release (“Help for Yuchi tortoises,” June 18). More than 90 Etowah darters were collected in annual monitoring at Raccoon Creek, according to cooperators The Nature Conservancy, Kennesaw State University, Corblu Ecology Group and DNR. The partnership working to restore and conserve the northwest Georgia stream and its watershed reports that catch rates for the endangered fish had been near zero since 2011. The unmarked gopher frog a UGA crew found at Williams Bluffs Preserve is a promising sign for efforts to create a breeding population of the rare frogs at The Nature Conservancy site near Blakely. John Maerz of UGA’s Warnell School of Forestry and Natural Resources writes that the metamorphic frog may be the second seen that wasn’t released but originated from on-site breeding (also: "Eggs mark leap forward,” Feb. 28, 2013). Land is valuable, and participants in the Sept. 17 Agroforestry and Wildlife Field Day at UGA’s Griffin campus learn ways to increase the value of the land they use. Topics vary from wildlife openings to prescribed fire and pond management. Register by Sept. 3. A note to Gmail users: If Georgia Wild issues are going to your Promotions tab and you’d rather they land in the Primary tab (we agree! ), here’s how to make the switch. In other landing news, a juvenile brown booby spotted this month in Dunwoody has stirred the Georgia birdosphere. The booby, a seabird more common in tropical waters, was the first documented in DeKalb County, and unfortunately hasn’t been since in the state. Names: DNR malacologist Jason Wisniewski, former DNR biologist Andrew Gascho Landis and Sandy Abbott of the U.S. Fish and Wildlife Service published a study in River Research and Applications exploring how adding water to increase a stream’s flow during drought affects mussels. The DNR Law Enforcement Division named Cpl. Casey Jones from Murray County the division's 2015 Ranger of the Year. Cpl. Bob Holley, assigned to Crisp County, received the James R. Darnell Award as runner-up. Friends of Georgia State Parks and Historic Sites presented First Lady Sandra Deal its inaugural Champion Award. The Board of Natural Resources this week recognized Ann Haines of Forsyth , who visited all 67 Georgia state parks in two years. Haines, who started her quest while still working full-time, had this message for Georgians: “I would encourage you to get out there!” Ronald Essig, a section chief in the U.S. Fish and Wildlife Service’s Wildlife and Sport Fish Restoration Division, is the new president of the American Fisheries Society. Orianne Society CEO Dr. Chris Jenkins has been nominated a second time for the Indianapolis Prize, the Indianapolis Zoo’s honor for leading conservationists. 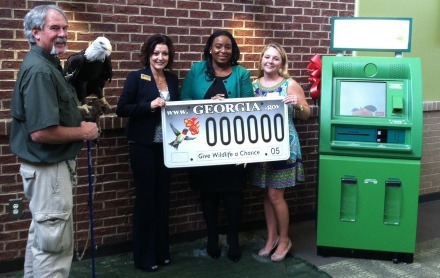 The ribbon-cutting for a Hall County kiosk where Hall and Banks County residents can renew their license plates – including wildlife tags – drew DNR’s Pete Griffin and eagle, pictured below (from left) with Hall Tax Commissioner Darla Eden, Motor Vehicle Division Director Georgia Steele of the state Revenue Department and Banks Tax Commissioner Becky Carlan. Bird banding at Panola Mountain State Park: 6 a.m. Aug. 29; 6:15 a.m. Sept. 12; 6:20 a.m. Sept. 20; 6:30 a.m. Oct. 4; 6:50 a.m. Oct. 24; 6:50 a.m. Oct. 31; 6 a.m. Nov. 14, 21; 6:30 a.m. Dec. 5, 19. Charlie Muise, Georgia Important Bird Areas coordinator. 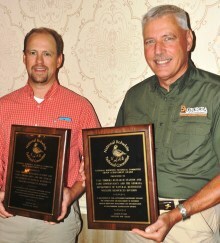 ** Dr. Theron Terhune of Tall Timbers Research Station and DNR Wildlife Resources Division Private Lands Program Manager Reggie Thackston with National Bobwhite Technical Committee awards.